For the past few days the Young Bond Dossier has been revealing the cover art for the upcoming paperback reprints of Young Bond in the United States. Actually, two are reprints: SilverFin and Blood Fever, while Double or Die will be a first edition. 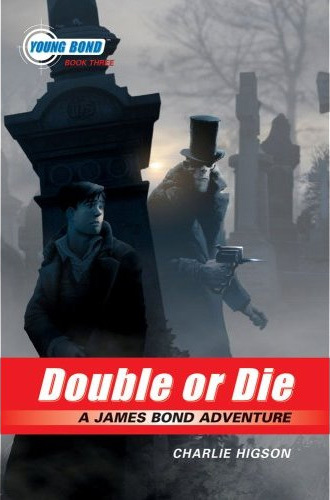 Double or Die will be reusing the cover art from the US hardcover (pictured), but the other two will be brand new designs from Kev Walker. Supposedly, Double or Die’s cover did rather well which is why SilverFin and Blood Fever are being set in a similar style. Of the three, I don’t think it needs mentioning that Double or Die’s cover is the superior one. This new style has something of a classic Hardy Boys style don’t you think? Maybe that’s all young male literature. I don’t know. Usually had the protagonist up front and center trying to get away from something. That’s like 80% of the Hardy Boys covers. Cover art for the forthcoming US hardcover edition of Hurricane Gold should be unveiled soon. Expect it to be in this same style.